I love working with other creative individuals, and Amanda Louise Campbell is definitely one of those people who inspire me! She’s not only a VERY creative interior designer, but she is a close friend of mine. Like me, she’s a young female entrepreneur from the South, and it’s been so much fun to work together for the past few years. She’s done an amazing job placing my work in her clients’ homes, and I absolutely love the way she has brought my studios to life! 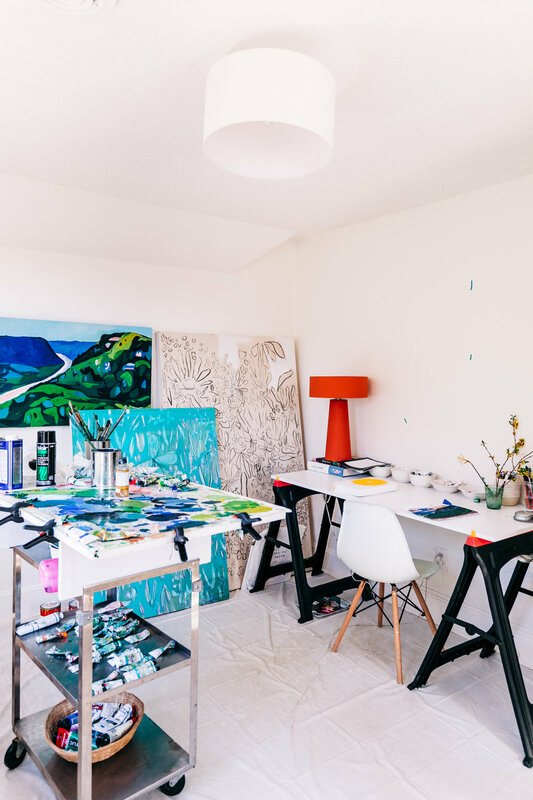 As a way to introduce the new studio space and to celebrate our work together, I sat down with Amanda Louise to talk about her journey as a business owner, what she loves about interior design, and how she approached working with an artist. It was always a passion of mine, though I kind of chickened out in school and didn't go the design degree route. I got my business degree instead and started working in a furniture store while I was in school. Through the store, I started going out to people's houses to consult on furniture, and then they would ask me to do more. As a young entrepreneur who started her own business, if you had to give advice to somebody thinking about starting out, or share something that you have learned over the years, what would you tell them? I think it all starts with passion. I think that's a huge, important part of doing anything. You can do anything for a small amount of time, but if you don't have passion, it's going to last. Because owning your own business is not easy, and there's a lot of rough days. So I think that’s the biggest thing. Other than that, just putting your head down and doing the work. I think it’s important to have goals, and to have overall themes, and to have a mission statement, and to have all these things that are kind of like a little bit lofty. But the biggest thing is just putting your head down and doing the work every day, and then the other things will kind of come. How how do you navigate not imposing your aesthetic on other people's spaces? Well, there is a balance. I’ve established a pretty distinct aesthetic — I use a lot of color, I use a lot of pattern. People are reaching out to me because my aesthetic somehow speaks to them. There's a balance between trusting me with what I do and letting me take the reins, but also knowing that I'm going to tailor it to you and your personality. You’ve done such a great job placing my work, which is one of your favorite pieces? I really love April Showers. It’s such a wonderful piece because, like I said, I really love color and pattern. I love your use of pattern and your work. Most of your work just gives off this sense of joy. Even the lines that you paint are just happy and clean, and I think they're just overall joyful, which is so wonderful to add to any space. That’s so kind! I love that description!! Was there anything particularly different about helping me design a studio space over helping somebody design their home? We talked a lot about how things make you feel. And I really worked on having it feel reflective of your personality — which is so hospitable and warm. I think with a studio space to have someone want to buy your work and to show your work in a way that is reflective of you, it has a lot to do with how you make people feel. That was a huge part of applying that to your studio space, so that it felt like you when anyone walks in. Were there any challenges with this space that you had to navigate? Definitely maximizing the space. It isn't a huge space, and you like to paint big! So, a key thing was making sure that we didn't use up wall space. We wanted to keep that seating area kind of centered in the middle of the space so that wall space was maximized and it would also work as a gallery.